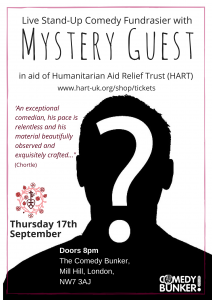 We are collaborating with the Comedy Bunker at Mill Hill to put on a comedy fundraiser for HART, featuring a TV celeb mystery guest! Every now and then, the Comedy Bunker have acts that cannot be named for any number of reasons and they are hosting one of these shows in aid of HART. This act appeared at the Comedy Bunker last March and absolutely tore the roof off. Join us for a massive laugh and support our aid and advocacy work with partners around the world, to alleviate poverty, empower communities and promote human rights. You can purchase tickets for £15 here. Students can purchase discounted tickets for £13.50 here. 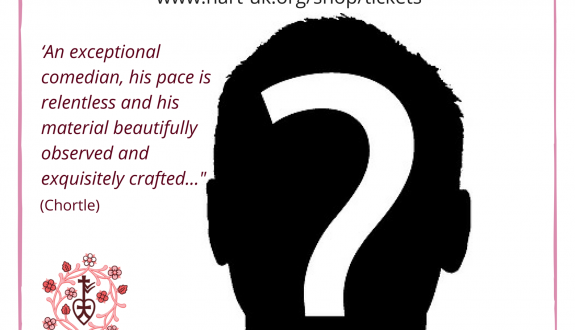 ‘A smart, probing brain lurks below the vertiginous quiff’ (The Evening Standard).